Kanaka (Tib. གསེར་ཅན་, Serchen; Wyl. gser can) or Kanaka Bharadvaja (Skt. Kanakabhāradvāja; Wyl. bhara dhvaja gser can) — one of the Sixteen Arhats. Born to a wealthy householder he grew up generous and compassionate, supporting the poor and giving alms to religious persons. Upon hearing the Buddha teach he disposed of his wealth to the poor and, requesting his parents' permission, he became a monk. After practising for some time he became an arhat. 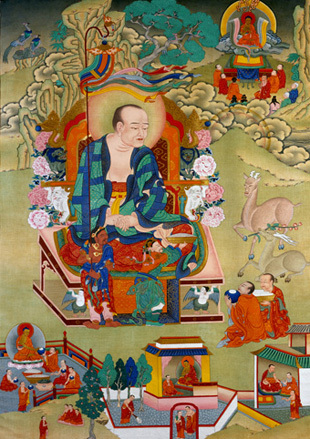 Kanaka dwells on the western continent (Aparagodaniya) with 700 arhats. His hands rest in the meditation mudra, seeing which helps beings to escape the lower realms and to attain joy and wisdom. Invoking him opens opportunities for practising the six paramitas and developing along the Mahayana path. This page was last edited on 5 August 2017, at 13:09.